- how to check your plane's CG. 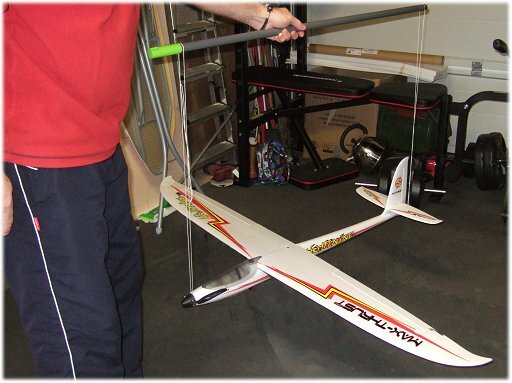 Correctly balancing your rc airplane is so important for safe flying, because an incorrect Centre of Gravity (CG or CoG) can potentially result in the plane being quite uncontrollable. Every rc airplane (and all other aircraft) has a specific CG position, it's the mean point where all gravitational forces act upon the plane, and the point where the plane balances fore-aft correctly. Technically this is called longitudinal balance. You can liken a plane's Centre of Gravity to the fulcrum of a see-saw, for example. The CG point is determined during the design stage of the plane or aircraft and is typically shown on a plan as a disc split in to four quadrants, as shown to the right. If you've built from a kit & plan, the CG should be clearly marked on the plan but if you've bought an ARF or RTF plane then the instruction manual will likely give the CG position, in terms of distance back from either the leading edge of the wing or from the nose. Incidentally some rc airplane manufacturers specify a range that the Centre of Gravity can fall into, rather than a single point. This is not unusual, and just means the CG can be moved forwards or backwards slightly without having an adverse affect on the plane's flight characteristics. Balancing a radio control plane correctly about its Centre of Gravity is so important because a very badly balanced plane will, at best, be hard to control. This is especially true for tail-heavy planes. At worst, the plane will crash within seconds of getting airborne. The first thing you need to do is identify the correct Centre of Gravity position according to the plan or manual. As a very general rule of thumb the CG will be about one-quarter to one-third of the wing chord (width) back from the leading edge of the wing. The main spar, if there is one, often lies in this general area. Again, this position is only a generalisation and in reality a CG point can be found anywhere from, say, 25% to 50% of the wing chord back from the leading edge. A CG point outside of that range is rare, but not impossible. A quick and easy method of balancing rc planes, if you don't have a special plane balancing tool, is this: Place the tips of your index or middle fingers under each wing, exactly on the line of the CG (i.e. the specified distance back from the leading edge of the wing or nose of the plane) and a couple of inches out from the fuselage sides. Gently lift the plane up so it is clear of any surface and let it rest freely on your fingertips. By the way, your plane must be 'flight ready' when you balance it i.e. flight battery pack in place or fuel tank empty. With the latter scenario, an IC plane is best balanced with an empty fuel tank otherwise the plane will become tail heavy as the tank empties during the flight. It's far better to start a flight slightly nose heavy than be landing slightly tail heavy! A correctly balancing rc airplane, sitting on your fingertips, will either be level or have the nose pointing slightly downwards. If the tail points downwards then the plane is tail heavy and you need to do something about that. If the balance does need to be adjusted to get the correct Centre of Gravity, the first thing to do is try moving the battery pack further forward or backward inside the plane. By doing this you are adjusting the balance without adding extra 'dead' weight in the form of ballast. In an electric plane this will be the flight pack that you want to try and move, in an IC plane it will be the receiver battery pack. Obviously you need to move the component in accordance with how the plane hangs: if it's tail heavy then move the component forward and vice versa. The battery pack is by far the best thing to move because it is the heaviest item and will have the greatest effect with the smallest amount of movement. Carefully try and reposition it fore or aft, carefully rechecking the balance of the plane after you've moved it. Once you're happy with the new balance, make sure that the battery pack is completely secure and won't move from its new position. If it moves during a flight, then the CG moves too - and that's really no fun! If you can't reposition anything, which is sometimes the case in an RTF plane, you might have to add ballast to either the nose or the tail of the plane to correct the CG. You need to remember, though, that ballast adds dead weight to a plane which is never good - the lighter an rc plane is, the better it performs (generally speaking, although there are exceptions). So if you do need to add ballast to correct the CG, add as little as possible. The way to do this is to add the ballast as far forward or as far back as you possibly can on the model. By doing this, the ballast will have the most effect on the Centre of Gravity. Add only enough to make your plane balance correctly, nothing more. Suitable ballast to add to a plane is modelling clay or fishing shots, for example. Thin sheet lead, if you can get it, is perfect because you can cut it and bend it to shape and the pieces don't have to be big to have an effect on the balance. Another ballast option is to buy special rc airplane ballast in the form of tiny metal balls which are fixed in place with an epoxy glue. Not every hobby shop sells it, but it's worth asking. Whatever ballast you do add, make sure it is secure to the plane and won't drop off in flight! The finger-method described above is a tried and trusted way of balancing an rc plane, especially if you don't have access to a special balancer. But if you do prefer a more accurate method then you can purchase a balancer such as the Great Planes balancer shown right. Such a tool is easy to use, here you can see it being used to balance my Extra 300. 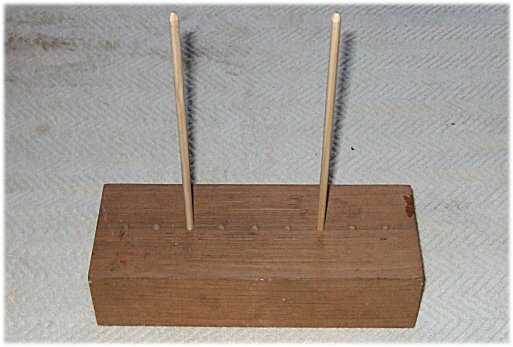 You can also make a balancing tool - something as simple as a heavy block of wood with two upright wooden dowels, approximately 10" long, will do the job for smaller planes. Simply drill holes in the block and push the dowels into them, ensuring a tight fit. So long as the plane can balance on two points, one under each wing, then you have a balancing tool. Above: a homemade rc airplane balancing tool. Simple but effective! Incidentally, balancing rc planes on fingers is frowned upon by some aeromodellers, since it isn't 100% accurate, but the method has served me well in the past when I haven't had a proper balancer. Also, a quick CG check can be easily done at the field on fingers. Roll, or lateral balance to give it its proper name, is an often overlooked task and isn't as critical as longitudinal balance, but an rc plane that has one side heavier than the other will have a tendency to naturally roll and turn to the heavier side, making your life on the sticks a bit harder. Also, a heavier side will almost always result in that wing dropping when the plane stalls, potentially putting the plane in to a spin. The usual cause of a plane being out of balance laterally is unequal weights of the wings. So, then, to roll balance your plane simply hang two lots of strong string from something stable (i.e. a ceiling), each piece being in a large loop. Put one around the propeller shaft, between the spinner and the fuselage, and the other around the rear of the fuselage, as close to the tail as you can get. 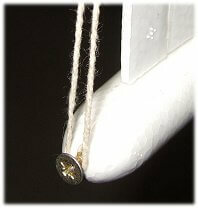 If possible insert a small-gauge pin or screw into the very rear of the fuselage to hook the string around, as shown right. This gives a more accurate result since the plane can hang more freely. Let the plane hang freely on the string - see if it wants to roll to one side or another. If it does then you need to add some small ballast to the wingtip of the lighter (higher) side. Add only enough to make the plane hang so that both wings are level. Taping the ballast to the wingtip is an easy method, although you might want to take the trouble to set them into the wingtip and cover over them to hide them. Bear in mind that adding larger bits of tape will actually add weight in addition to the ballast. For rc airplanes with foam wings, pushing a small gauge nail or panel pin into the foam is a great way of adding any necessary weight, and it can be easily hidden with suitable paint or marker pen. So there you have it... two easy methods of balancing rc airplanes. As already mentioned, the longitudinal balance is very critical if you want to keep your plane in one piece. Lateral balance isn't so critical but is worth doing anyway. Recently a plane of mine needed 10 grams of weight on one wing to even things out, and it did make a real difference to how it flew - so do take the time to balance your plane both ways. 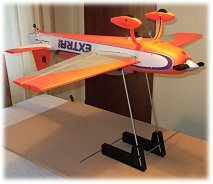 A correctly balanced rc airplane will always be safer and easier to fly, and won't need as much trimming at the transmitter. Learning to fly rc airplanes. RC flying do's and don'ts. Beginner's Guide To Flying RC Airplanes.